Behold the power of women! These are the inspirational real-life stories of female superstar athletes Serena and Venus Williams, Simone Biles, Carli Lloyd, and more -- role models all. For sports fans, aspiring athletes and readers of sports biographies. Growing up in a crime-plagued, gang-infested neighborhood, Venus and Serena Williams were led to believe their environment was not a place where dreams could come true. It took a relentless determination, a burning desire to be the best, and a willingness to conquer racial barriers for them to emerge as tennis legends. Simone Biles was raised by a single mother with addiction issues, forcing her grandparents to intervene. But Simone soon discovered balance beams and gymnastics mats, setting her on a path toward Olympic greatness. Carli Lloyd, meanwhile, believed her youth soccer career was really starting to take off, only to be cut from her team. Instead of quitting the sport she loved, Carli rebuilt her confidence from the ground up, ultimately becoming one of the leaders on the World Cup Champion US Women's Soccer team. The athletes featured in this book met earth-shaking challenges head on, and through hard work and perseverance, went on to conquer the sports world. This collection of mini biographies, complete with first-hand content drawn from interviews, is a source of inspiration and self-empowerment for kids and sports fans of all ages. 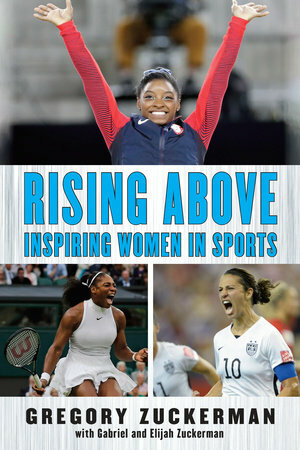 Also included in the book: Wilma Rudolph (track and field), Mo'ne Davis (Little League baseball), Swin Cash (basketball), Elena Delle Donne (basketball), Bethany Hamilton (surfing), Ronda Rousey (mixed martial arts), and Kerri Strug (gymnastics). After 120 grueling minutes of play, the score remained tied at 2–2. The final match in the 2011 Women’s World Cup would come down to penalty kicks to decide the winner. A palpa­ble tension filled the stadium as the US and Japanese soccer teams retreated to their benches to prepare for the shootout. Carli Lloyd and her American teammates felt the pressure building. The US team had endured a difficult journey to get to the finals. They were nearly knocked out in a quar­terfinals match against Brazil, surviving after tying the match in the 122nd minute and then winning on penalty kicks in one of most riveting games in the his­tory of the Women’s World Cup. It had been twelve years since the US Women’s National Team had reached the finals. Carli knew a single goal could make the difference. She had been benched during the early matches of the World Cup but she knew this was the perfect opportunity to solid­ify her spot on the team and become an instant legend. Carli approached the penalty box, preparing for her shot. “All these mixed emotions are going through your head,” she says. Does the goalkeeper know where you’re going? Do you hit it harder or softer? Focused, Carli approached the ball hard and blasted a powerful shot toward the middle of the goal. The goalkeeper dove to her right, leaving an opening close to the top of the goal, exactly where Carli was aiming. For a moment, it looked like her shot would find net and Carli would be a hero. Glancing up, however, Carli watched in horror as the ball soared high over the crossbar, badly missing its target. Carli stared ahead, almost in disbelief, cupped her mouth with her left hand, and quietly walked back to join her teammates. The US Women’s National Team had lost to Japan, extending their trophy drought. For days, Carli was dejected and depressed. It was the lowest moment of Carli’s life, an expe­rience that would have completely demoralized many players and even ended some careers. Somehow, Carli would have to find a way to turn this major setback into something more positive.